Volunteers for the Volunteer Income Tax Assistance (VITA) program help provide free tax preparation and filing services for low- and moderate-income individuals and families earning up to $54,000. Without this program, many taxpayers in our community would not file their annual tax returns. 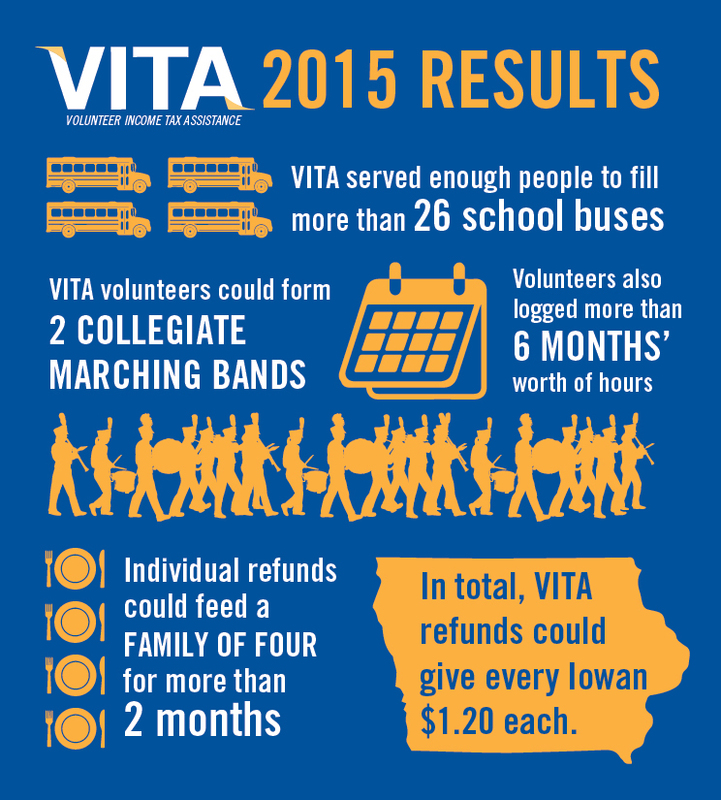 During the 2015 tax year, VITA volunteers completed and filed state and federal income tax returns for more than 1,700 people in Linn County alone. As the program expands, so does the need for volunteers. This year, VITA needs a total of 70-80 volunteers for Linn and Jones Counties. As a VITA volunteer, you can receive IRS certification at no cost to you, build your resume, and benefit our community by helping others get the tax credits they qualify for, including the Earned Income Tax Credit (EITC), Child Tax Credit, Education Tax Credit and Child Care Deduction. The money these families receive from their tax returns will help them pay bills and put food on the table. Tax Preparers: Help individuals and families prepare their tax returns and ensure all eligible taxpayers receive their qualifying tax credits. You will receive professional tax and software training. We also need multilingual tax preparers. Greeters: Welcome VITA participants to the site and ensure they have all required documentation. If you would like to become a volunteer, please fill out the VITA volunteer form, or contact Cliff Ehlinger at cliff.ehlinger@uweci.org or 319-398-5372 ext. 812.